Emma Thompson's embarrassment about her Saving Mr. Banks haircut was so evident in the THR actresses roundtable I posted just before Thanksgiving, I thought I'd dig a little deeper. I found this bit (below) about her hair in Variety; clearly the acclaimed actress was really unhappy with the results of the perm. I'm tempted to post a picture of me in my bad - not badass - perm from the 70's. That would cheer Ms. Thompson up considerably, not that she needs it. Bad perm or not, Saving Mr. Banks is getting all kinds of good press and Thompson herself is getting raves for what sounds like a show-stealing performance. 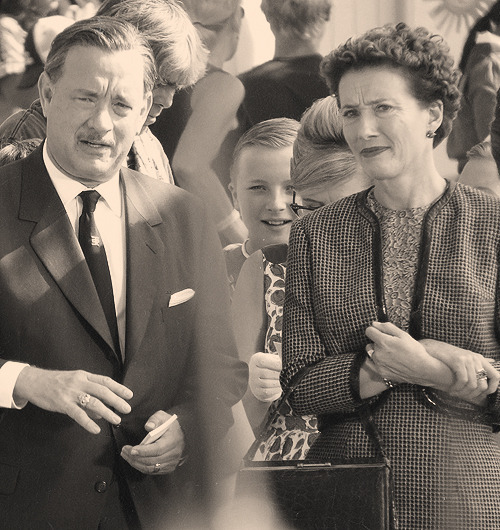 "An unforeseen battle in the making of “Saving Mr. Banks” had to do with Thompson’s hair for the role. In real life, Travers had a simple bubble cut with frilly curls. The hairdo matched her steely personality, and was a crucial foothold into the character. But Thompson is wig averse: “I think a lot of energy comes off the top of your head when you’re acting,” she says, “and a wig really puts the lid on it.” So she visited a salon to get the Travers cut. “I went in willingly like the proverbial woolly lamb to the slaughter and I came out looking like a baby woolly mammoth,” Thompson says. She wasn’t expecting her hair to feel so tight after her perm. She tried to unspool the curls, even going as far as rubbing olive oil on her scalp, but it was no use. Talk about curly ... the real P.L. Travers curly do blends right in with the foliage. Maxxed out on hair talk? Watch this six minute edited interview where Thompson, without a word about the hair, talks about P.L. Travers, songwriters Richard and Robert Sherman (Travers HATED the music) and compares Tom Hanks to Walt Disney saying both men have an enduring charm, an 'everyman' quality and the power of an emperor ... Saving Mr. Banks opens December 20th here in the states.